Circa 1998. The 13th Floor played at the Mug on many Friday nights. There were bars closer to home, but the Mug sort of became my home.It was at the Mug that I hooked up with Wendy. After a short romance we parted, but remain close friends to this day. Until now, my paintings and style were disjointed. Somewhat dark and not really cohesive. Some had merit, but most were a mess, both stylistically and psychically. Then one day I got out some acrylic paints that I had laying around. I had painted only in oils prior. And I painted a subject that I knew all too well, the local bar. The Frosted Mug. I painted another, which was soon sold. And another, also sold. They included the bartenders, and were are now in their possession. This painting I gifted to Liz. 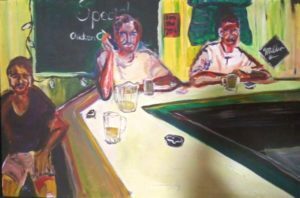 I have since lost track of the number of American Bar Series paintings I have done. After beginning the series in acrylics, I have once again switched back to oils. I have slowly evolved my style to be more impressionistic abstract. However all paintings are of bars that I have spent time in. I try to capture the nuances that make each establishment special to me. The Frosted Mug is no more. It switched hands, tried to become more upscale. I never spent much time there after that. After all, nobody likes change.